The Hastings Cliff Railway is a funicular railway located in the seaside town of Hastings in the United Kingdom. It is owned and operated by Hastings Borough Council. It carries passengers from George Street to the ruins of the Hastings Castle at the summit of the hill via the East Hill. The track length is 267 feet and is a double track system. One car can carry 16 passengers and it operates on electricity. The line was shut in 2007 due to an accident which caused the cars to shut and created a disturbance in the operation of cars and station. It was reopened in 2010. This funicular railway is located in city Budapest, Hungary. It connects Adam Clarke Square and Szechenyi Chain Bridge to the Buda Castle above. This line commenced in 1870, it got destroyed in Second World War but then got again reopened in 1986. This funicular was second in Europe after the one in Lyon which had a similar system of transportation. The line is 95 metres in length. The line is a 2 car double track and can carry 24 passengers per car. It has a maximum speed of 2.5 metres per second. It works on electricity. The line is operated by a mass transport company of Budapest. The Montmartre Funicular serves the Montmartre neighbourhood of Paris, France. It was opened in 1900 and it was rebuilt in 1935 and again in 1991. It is a double inclined elevator. It operates every day from 6:00 to 00:45. It carries around 6000 people in a day and around 2 million people in a year which includes tourists and other Parisians. It is an electrical traction service and has 2 cabins running parallel to each other which can carry 60 passengers per cabin at a time. It covers the track of 108 m in 90 seconds. The funicular runs alongside a 220-step staircase. 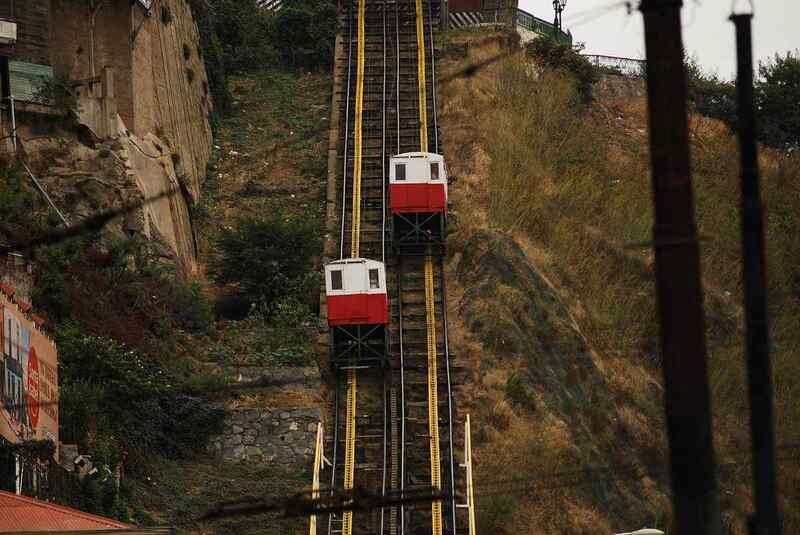 It is one of the 16 funicular railways in the Chilean city of Valparaiso. It is privately owned and connects the city with the Artelleria Hill. It was originally a double track system in 1892. But it became so successful that there was a need for other tracks. So another line was constructed beside the first one in 1908. Each car has the capacity of carrying 25 people. The trip lasts for 80 seconds. The track length is 175 metres. It is a big urban landmark in the city. The drive equipment is at the top station and payment has to be made there only. The Gloria funicular is located in the civil parish of Santo Antonio in Lisbon, Portugal. It links the Pombaline downtown with the garden Bairro Alto. The funicular operates on electricity. It consists of 2 cars which run parallel to each other that climbs and descends simultaneously. It was designed by architect Raoul Mesnier du Ponsard. It was constructed in the 19th century. The cars have the capacity of carrying 22 passengers each. It first came to service in 1914. The Mongohela Incline is located in Pittsburgh, Pennsylvania in the United States of America. It was built by John Endres. Its construction got completed in 1870 and was opened on May 28, 1870. It is the oldest funicular in operating condition in the United States. It is a double track system. The cars can carry 23 passengers each. The track length is 194m. It travels at the speed of 9.7km/h. It operated on electricity. The Flying Dutchman is located in the Western Cape Province of South Africa. It is also known as the ‘Cape Point Funicular’ as it is located at the Cape Point near the Cape of Good Hope. It connects the Cape point car park to the upper lighthouse. It takes its name from the legend Flying Dutchman ghost ship. This funicular was the first commercial line of its kind in Africa. It is a single track line having a passing loop at the midway point. The track is 585 metres long. The two cars are powered by electricity. The cars have a capacity of carrying 40 passengers. The journey from down to top lasts for about 3 minutes. The two cars can carry a total of 450 passengers in an hour. The cars are named as ‘Nolleth’ and ‘Thomas T. Tucker’ after the names of vessels that sank in that area. It operates from 9:00 to 17:00 every day. The Sant Joan Funicular is located at Montserrat, near Barcelona in Catalonia, Spain. The track links the monastery and Montserrat Rack Railway with the sacred sites, walking trails and the viewpoints at the summit of the mountain. Originally, it was constructed in 1918 but modified to increase the car capacity in 1926. It was modernised in 1997 with transparent roofs. It has a maximum gradient of 65% which makes it the steepest funicular in Spain. It has a track length of 503 meters. There are two cars each having a capacity of 60 passengers at a time. It reaches the destination in 6 minutes. It operates on electricity. The line is operated by Ferrocarrils de la Genaralitat de Catalunya. Naples Funicular is the Central Funicular Railway system of the city of Naples in Italy. It links four stations: Piazza Fuga, Petrio- Via Palizzi, Corso Vittorio Emanuele, and Augusteo at Piazetta Duca Aosta. It is one of the longest funiculars of the world and it even has the capacity of transporting 10 million passengers in a year. It has a gregarious capacity of carrying an average of 28,000 passengers in a day but it reduces to 10,000 on weekends and holidays. The track length is 1,270 metres with an average gradient of 13%. Each train can carry 420 passengers at a time. The Zagreb Funicular is situated in Zagreb, Croatia. It is operated by a public transit authority of Zagreb, ZET- Zagrebacki elektricni tramvaj. It links Ilica Street with Strossmayerovo šetalište (Strossmayer promenade). Its track length is 66 metres making it the shortest public transport funiculars in the world. The funicular was built and opened in 1890. Originally, it was propelled by a steam engine and then was modified to work on electricity in 1934. The funicular has two cars each having capacity of carrying 28 passengers each. It travels at the speed of 1.5m/s at which it can cross the distance of 66 metres in 64 seconds. The rides are scheduled every 10 minutes from 6:30 to 24:00. It has an inclination of 52% which makes it one of the steepest funiculars along with one of the shortest covering distance funiculars in the world. These are the best funiculars in the world. Do post your comments.